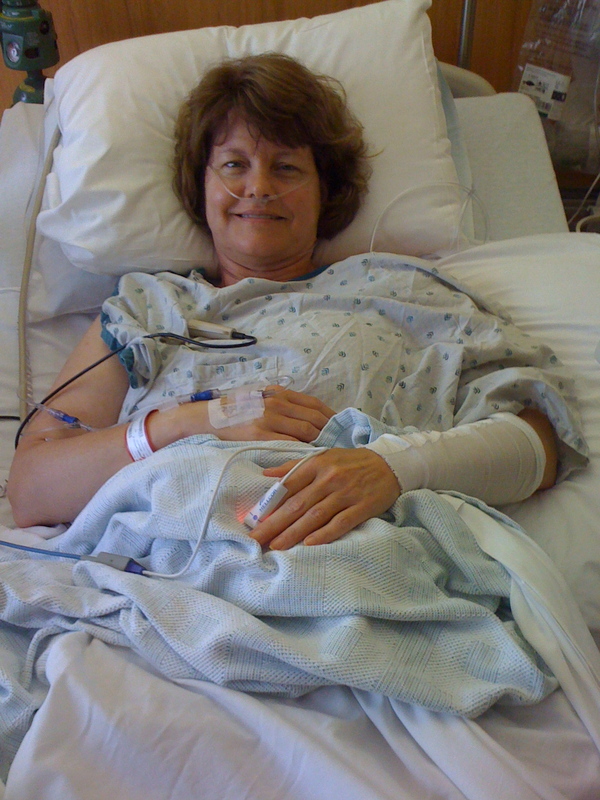 Here is a photo of me in the hospital the day after reconstruction – being naturally small breasted, the reconstructed side is noticeably larger than my “God given” breast (as Dr. Ferlmann describes one’s natural breast). And so begins my lopsided or ‘cattywompus’ phase. First I was lopsided after the mastectomy and now I’ve got the opposite problem. Solution: move the prosthetic “puff” to the other side, and presto, I’m balanced. It kinda reminds me of junior high when girls would stuff their bras, but it’s better than walking around having people stare (or try not to stare at you) while a the same time trying to figure out whether there is something wrong with you or you just need a better fitting bra. In the ‘industry,’ the phase after your mastectomy, if you elect to undergo it, is called “reconstruction.” Some women, infact most women these days, elect to undergo reconstruction as part of the mastectomy. The surgeon removes the breast and tissue and before closing the plastic surgeon steps in and immediately performs the reconstruction. When the patient wakes up, there is no flat chest, but instead a “breast mound” where the breast was and to many women that is mentally reassuring. I opted not to do immediate reconstruction for three reasons: 1) I needed further genetic testing; 2) I hadn’t made any decisions about reconstruction or what type or picked my PS; and 3) I needed to get my mastectomy done quickly to meet the winter break schedule of school. I delayed reconstruction until 5 months after my mastectomy, which worked best for me. I finished my reconstruction in November 2011 with my final switch out and augmentation surgery, ending my ‘cattywompus’ chapter. I was so glad to be ‘in balance’ once again.